With a holiday last Monday, I decided to take a week off from the G&N. Feeling refreshed, now it's time to take a look at the players who may actually know how to win games and not fight with their teammates. Gary Sheffield (Det - OF) - After a rough start in April, Sheff has turned it on in the last month. This past week he went 10 for 29 with 4 homers and 9 RBI. Brad Hawpe (Col - OF) - Here's another guy that kick it up a notch in May. Hawpe closed out the month with a homer in three straight games, and has helped the Rockies win 9 of their last 12 games. Prince Fielder (Mil - 1B) - I read a nice article last week about Fielder and Tony Gwynn Jr. It seems the Gwynn family sort of took young Prince in when he was first starting out in the majors and offered some family support that was never there with his dad Cecil. Perhaps Tony Sr. showed him a thing or two about hitting as well, since Fielder's average is much better than "Big Daddy" ever hit. Prince went 8 for 23 this past week with 4 homers to bring his NL leading total to 19 on the season. Dan Uggla (Fla - 2B) - Uggla had a nice week as he began a 7 game hitting streak. He seems like a good guy to have on your team. 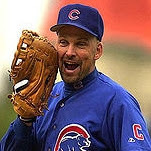 Of course if he were on the Cubs, he'd probably rot in AAA while we had to endure Mark DeRosa. Vladimir Guerrero (LAA - OF) - Guerrero batted .423 this week with 2 home runs including one yesterday that wound up being the game winner for the Angels. Doug Davis (Ari - SP) - Davis picked up two wins on the road this week against the Mets and Phillies. After a few rough outings earlier in the month, Doug ends May on a positive note. Jeremy Bonderman (Det - SP) - After starting the season with 5 straight no decisions, Bonderman has now won 5 straight, including two games this week versus Cleveland and Tampa Bay. Joe Blanton (Oak - SP) - Blanton had the Twins baffled on Saturday en route to a 3 hit, complete game shutout. Joe struck out 6 and walked none during the outing. Howie Kendrick (LAA - 2B) - Howie managed only 1 hit this week and struck out 7 times. He finished up the month of May with a .152 AVG, and is now hitting .236 for the year. Corey Patterson (Bal - OF) - 2 for 20, no walks, 6 strikeouts. Can we bring him back? He'd fit right in with the current gang of outfielders. Carl Crawford (TB - OF) - For those that don't follow the D-Rays or play fantasy baseball. Crawford is usually a pretty damn good player. Despite that, Carl had a rough week at home hitting only .125. His home batting average is now .268 while his average on the road is .336. Just more proof that Tropicana Field is the most depressing place on Earth to play baseball. Michael Barrett (ChC - C) - Ugh, for reasons I don't feel the need to rehash. 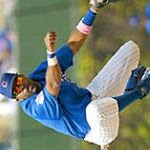 Damion Easley (NYM - 2B) - Hey, remember back when Damion Easley actually mattered? Yeah, neither do I.
Adam Eaton (Phi - SP) - Eaton was roughed up on Friday for 5 runs on 6 hits and 4 walks in 2 innings of work. If only the Giants could face Eaton every outing. Vicente Padilla (Tex - SP) - Just as bad as Eaton was former Phillie Padilla. The Mariners teed off on him over 3 innings, getting 9 hits and 7 runs. How this guy still has a starting job at this point is beyond me. Carlos Zambrano (ChC - SP) - Friday's stats: 5 innings, 13 hits, 6 earned runs, 2 walks, 0 strikeouts, 1 TKO. I think we can officially say the dominance of the "Fat Z Era" has come to an end.